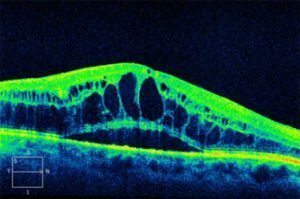 Optical Coherence Tomography (OCT) is a specialised scan that uses the properties of light waves to build a digital 3D cross-sectional model of your eye. 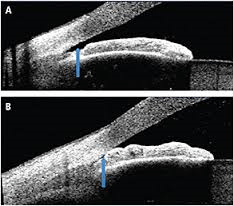 In particular it is used to scan the retina (the light-sensitive tissue lining the back of the eye). individually in high definition. This allows your Optometrist to detail the thickness and contours of each layer. These measurements can help with the early detection, diagnosis and early treatment for many eye conditions, including macula oedema, age-related macular degeneration, glaucoma and diabetic eye disease. OCT is also used to evaluate the health of the optic nerve which is affected in glaucoma and other optic nerve head diseases. The optic nerve is composed of many small fibres that carry signals from your retina to your brain. The OCT examination can detect subtle changes to the fibres of the optic nerve before glaucoma starts to affect your vision. In most cases no dilating eye drops are required for the scan. In some cases we may decide to use dilating eye drops to improve the image quality. You will be seated in front of the OCT machine and your head rested on a support to keep it still. The equipment will then perform a series of scans on your eye. Scanning usually takes between 2 and 10 minutes. After the OCT scan, a report with images is immediately generated. Your optometrist will then explain the results of the test and advise you on the need for any further examination or referral onto other medical professionals. What is the cost of taking OCT? An OCT machine is a sophisticated and highly specialised piece of equipment that is not readily available. As such there are higher costs involved with routine operation and maintenance. Medicare Australia currently does not provide any rebates or benefits towards retinal imaging at this time. The benefits of having an OCT scan certainly outweigh the costs of the scan. Having high-resolution images of your eye and retina enables any subtle changes in the optic nerve head or macula regions to be tracked easily. The OCT report can also be kept by the patient and used by other eye health professionals such as ophthalmologists, if necessary.